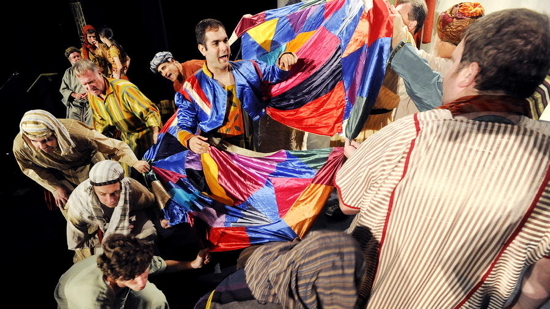 Michael Ferrante, center, playing Joseph, and his eleven brothers practice a scene during a dress rehearsal of September Song’s production of Joseph and the Amazing Technicolor Dreamcoat at the Carroll Arts Center in Westminster Tuesday, August 30, 2016. Photo by DYLAN SLAGLE/CARROLL COUNTY TIMES. Who knew the Old Testament could be so exciting? “Joseph and the Amazing Technicolor Dreamcoat,” playing this weekend at Carroll Arts Center, brought the ‘coat of many colors’ story to life with catchy music, great dance numbers, and even some humor. The story is based on the Biblical story of Joseph (Michael Ferrante), found in the Book of Genesis. Three narrators tell the story of how Joseph is his dad’s favorite and so is given a beautiful coat of many colors. Between the coat and Joseph’s dreams that he will rule over his brothers, his siblings are completely jealous. They sell Joseph as a slave, and he’s taken to Egypt; the brothers tell dad that Joseph was killed. Joseph ends up as a slave to Egyptian millionaire, Potiphar (Chip Cotterman), and everything’s going great until Potiphar’s wife (Casey Golden) starts hitting on him. Angered, Potiphar throws Joseph in a jail cell. Naturally, Joseph is completely depressed, but his spirits rise when he meets two of the Pharaoh’s former servants and interprets their dreams. Obviously, Joseph has skills and so is taken to meet the Pharaoh (Michael Livingston) and interpret a dream he’s been having. Joseph interprets the dream as seven plentiful years of crops followed by seven years of famine; Pharaoh puts Joseph in charge of the preparations needed to endure the impending famine (making Joseph the second most powerful man in Egypt). Back home, the famine has caught up with Joseph’s brothers so they decide to go to Egypt to beg for mercy. Joseph (unrecognized) gives them sacks of food, but also plants his golden cup in his brother Benjamin’s sack and then accuses the brothers of robbery. When the brothers tell Joseph to take them instead and set Benjamin (Dylan Snaman) free, Joseph, impressed by their selflessness, reveals himself and sends for his father. In a musical like this one, where the entire story is sung, it’s vital to have good singers. Fortunately, September Song’s production of “Joseph” did not disappoint. Joseph’s rendition of “Close Every Door” was haunting, sad, and beautiful. In this scene, I felt like we really got to know Joseph as a man and feel his pain after being thrown into the jail cell by Potiphar. 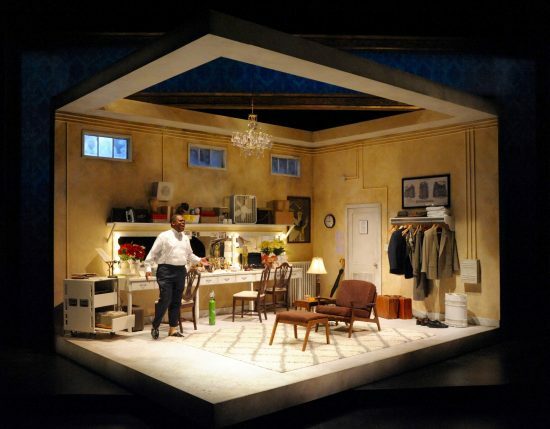 Each and every word was clear; it sounded just as good as any Broadway recording. In the background, members of the ensemble held lighted candles and their singing seemed to echo in the theatre, adding to the haunting quality of the song. Along with the amazing voices, the melodies and lyrics in “Joseph” are entirely memorable (after all, this was the first Andrew Lloyd Webber and Tim Rice musical to be performed publicly) and worth the price of admission. I was thirteen when I last saw “Joseph,” and I actually remembered most of the music from some 25+ years ago. The show also contains many different styles of music, which adds to the humor and keeps the audience entertained. “One More Angel in Heaven” is a country song, with the brothers decked out in cowboy hats and the cast performing some great country dancing. “Those Canaan Days,” where the brothers recall bountiful times before the famine, is a sad, French number, with the brothers wearing berets and sitting at café tables with bottles of wine. And “Benjamin Calypso” brings “Joseph” to the islands, protesting Benjamin’s innocence regarding the golden cup (“he’s straighter than the tall palm tree”). However, the most memorable ‘style’ is Pharoah’s Elvis-themed numbers. The youngest members of the cast (who provided ‘the cute factor’) wore Elvis’s infamous white jumpsuit, red scarf, and sunglasses (credit goes to Costume Master Janine Polanowski), and Pharaoh taught one of the young actors how to do the Elvis lip curl. In the middle of one of the numbers, Pharaoh addresses the audience, asking whether everyone is having a good time and even relaying the information that most of the shows are sold out (adding a personal touch uncommon in musicals). Speaking of costumes, there were some stunning pieces – including the all-important coat of many colors, which held true to its name and glittered on the inside. The coat was also used as a prop; in two of the numbers, the brothers used it as a kind of parachute and circled around (a good choice by choreographer Amy Appleby). Joseph’s ‘second in command’ outfit was also noteworthy, a beautiful headdress and belt in shimmering blacks and golds. Potiphar, his wife, and his staff were decked out in animal prints (which was fitting considering his wife’s ‘animalistic’ behavior and also lent some humor to the show). All in all, this was one of the most entertaining shows I’ve seen given the catchy melodies, great lyrics, beautiful costumes, and amazing singers. “Joseph” is a feel-good musical that the whole family can enjoy. I’m glad I was able to travel to ancient Egypt – even if it was for only around two hours. Running Time: 1 hour, 50 minutes with a 20 minute intermission.